On November 17th of 2009 I started this blog with short sighted goals and plans in mind. I didn't really have a plan, but knew that I wanted to share all that I was learning in the hopes that it would reach others and they would be able to learn like I was. 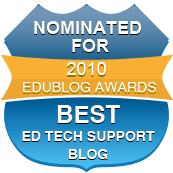 When I started writing this blog, I was a Technology Integration Specialist and I assumed that I would be in that position or position similar to it for quite some time.That job lasted just two years, but were probably the most valuable two years in education to date. I learned about all these great ways to teach my students and grow professionally. I began to use and advocate for the use of Twitter by teachers as a professional development tool. The writing of this blog greatly increased my interest in being an educator and about education inside and outside my classroom. The professional relationships that I created virtually often brought my spirits up about the great things teachers were doing. I admit I have gotten away from using Twitter in a professional manner recently due to time constraints and examining my priorities, but I know it is always there when I need to find something. The TIS job did more for me professionally till this year. In my current position I examine curriculum and data and the impact of assessment in education. I have learned a lot about the workings of a school. Prior to my Curriculum Coordinator position and after my TIS position I went back to the classroom for a year to teach social studies and embedded a lot of what I learned into my classroom. I allowed students to use cellphones while monitoring their use. I saw lots of great things in other classrooms that I took to my own classroom. We used several web 2.0 tools for project based learning and for collaboration and communication. Professionally and pedagogically I have had a swing of thoughts impacting my views on education. Professionally, my life took turns that made it difficult to maintain this blog as I was doing so in 2009 and 2010. It also didn't help that my domain got sold as well. Personally, my life also took positive turns, as my wife and I had a little boy and added a little girl to the mix as well. Therefore, this greatly impacted my ability to post on a regular basis, plus I found myself taking my laptop home, working on this blog instead of spending time with my kid. I enjoy keeping this blog in more ways then I imagined I would when I first started it, but my priorities changed. I have contemplated going back to buying a domain, but until I can develop a routine, I don't see a reason to at this point. Looking back at the three years, there have been a lot of remarkable and memorable posts. I wanted to bring those back for this post for those that might be new to the blog, or just wanted a quick refresher. 1.) Doing a FLIP Across the Curriculum - Even though FLIPs are no longer in production, it doesn't mean the concepts of using video have changed. 2.) Common Misconceptions of Technology Integration in Education was a series of post I did related to what I was seeing about technology being utilized in the classroom. 4.) 7 Technology Alternatives for Standard Homework Assignment was a post I did in preparation for a conference presentation. There are also several more in the comment section. 5.) Twitter was and is still a popular and new tool to educators. I wrote several posts about Twitter and some of the most popular are below. Now the question I have to ask is where do I go from here? What should be the goal of this blog. I miss the days of creating posts that get tons of visits and hits. I often wonder if it is because of the "blogpost" that limits access to my blog that I was getting before or if it mostly do to the types of posts. I often think it has a lot to do with me getting away from using Twitter more often. 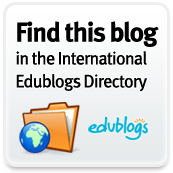 Hopefully I will still continue to use this blog as a way of sharing tools that I discover and my experiences in and outside the classroom. Thank you to those of you who have loyally stayed with me through these professional changes.